What a gorgeous sunny day we have here in Brighton although something tells me that there won't be too many more of these types of autumn days so I am enjoying the sunshine streaming into the house whilst I can. We rose early today and went off to the markets and a new little antique shop that I have discovered nearby. I brought home some treasures but I will leave them to show you another day because I have so much to show you and tell you about from the Quilted Crow's Autumn Gathering which was held at Campania yesterday. 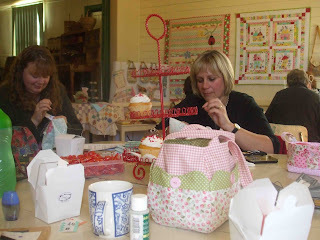 Here is the lovely Cathy and Sarah stitching away. I didn't take any other photo's of the other bloggers because time just flew, by the time I realised I hadn't taken many it was time to go home - But I do know that others have heaps of shots - Some not so glamorous - So keep an eye on the other Tassie Bloggers sites. This was our arrival parcel. 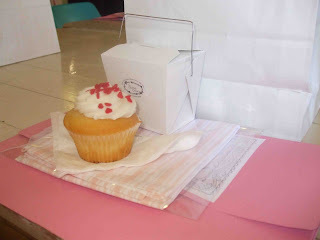 A lovely cup cake, dish towel, box of sweets and our pattern packs. This is the lovely Doiley for Deidre by Helen Stubbings . Jo created a beautiful version of this on the day. I can't wait to see it completely finished. Here is an oven mitt designed by Natalie Ross - It is gorgeous. This is the project that I chose to start on the day. 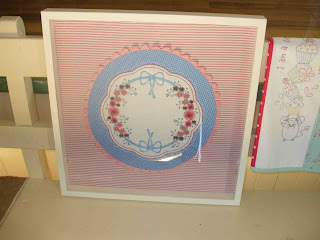 Natalie also designed a lovely apron and pot holder (trivet) to go with it. They are stunning !! 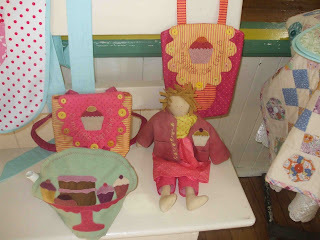 Here are the designs from Deidre (Quilted Crow) - Backpacks, Dolly and Tea Cosy. 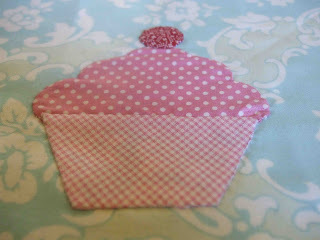 Here is my little needleturned cup cake for my oven mitt. Both Helen and Natalie were super helpful and were both lovely ladies and so generous with their time. 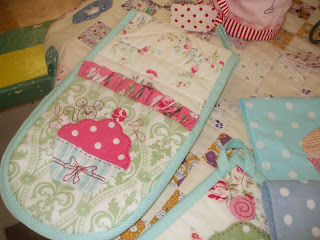 Above is all of the yummy fabric and Mug Carry Bag Kit. It was a lovely day with great company and many laughs. I am already looking forward to the next one. Everything looks so pretty. I'm glad you had a good time. Hi Fiona. Thanks for sharing all your pictures. Looks like it was a great day (as usual). So hope I can make the next one. 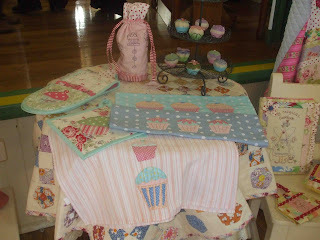 Love the cupcake you stitched and can see why you had to keep visiting the shop ... gorgeous purchases. Oh Fiona, it sounds like a wonderful day!! So many pretty things and such good company!! I would have chosen what you did too... it's so lovely!! Can't wait to see yours finished too! Oh my Fiona, it looks like you had the most wonderful time, all that creativity, and what inspiration - how you you not have fun! Looks like to much fun stuff there, how could you decide. Well done on completing the cupcake, I think I would still be trying to decide what to make. 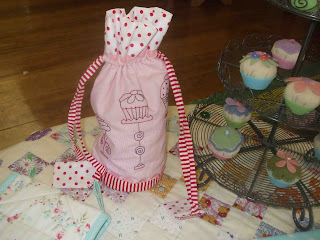 lovely you popped by my blog ...my marshmallow stuff sold like the proverbial hot cake!! cakes..
went back to get MORE of MORE today...but voila..
have a lovely week & enjoy the sunshine...know what you mean...beautiful day in melb...but how long will it last??? I just love all those gorgeous cupcakes on the different cupcukes. 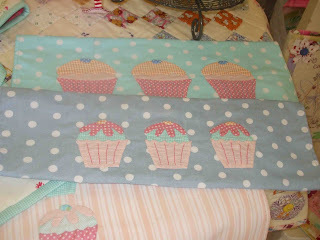 Cupcakes are definitely one of my favorite, especially with the fabrics and colors you used!!! 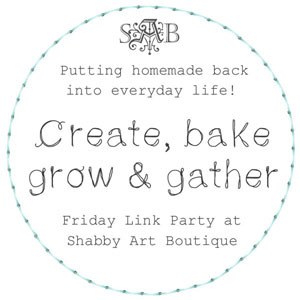 I looks like a fantastic day of fun & goodies! What a fantastic day for you ladies! That sounds like lots of fun. How on earth were you able to decide on what to sew? I wouldn't have been able to choose. What a great day. Wish I lived closer so that I could attend. Thanks for sharing. okay spill the beans Fiona, where is the new antique shop? - you cant have all the goodies! Fiona, it looks like all you gals had a great time. All the cupcakes were so cute. Doesn't it make you feel really good to get together and stitch the day away. What a fabulous day you had!! So many decisions...projects? fabrics?...the best kind of choices to have to make! It all looks so lovely! I admit I am a bit envious! I wish we had these type of wonderful gatherings here in the states where I am. You ladies down under have really taken the quilting and stitching to another level! 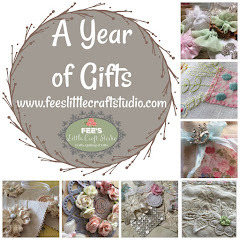 My favorite stitchery/sewing/quilting things come from your neck of the woods! 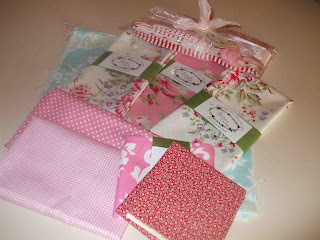 The fabrics you purchased are gorgeous! Feminine and romantic looking, my favorite! What a great time you had. Cupcakes are a favourite subject and the designs look fabulous. Enjoy the feeling of the day! What a lovely day you had. And look at all the goodies you showed! Can immagine why you kept going back to the shop. What a beautiful day you have all had...and I love that pot holder!!! Everthing look so lofely. I love the colors...the cupcake is so cute! 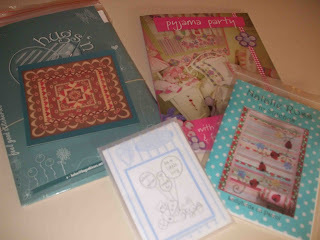 I dithered as to write a comment, as everything had been said - So lovely colourful post, everything so pretty. 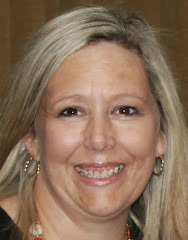 Hello Fiona, Thank you so much for visiting my blog. I have had the most enjoyable time looking at your lovely blog. 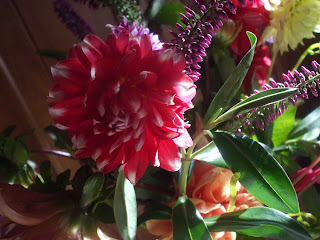 This post is filled with pretty keepsakes and such colorful photos. It looks like you have a delightful group to spend the afternoon with. I made it! Had a very, shall I say 'different' kind of week!! Tell ya later! Looks like tons of cupcake goodness without the calories!